Streaming service HIDIVE have announced their app for Xbox One is now available! After months of waiting you can now watch the latest episodes of Bloom Into You or even older anime such as No Game No Life Zero, Pop Team Epic, Revue Starlight, Sword Oratoria, and Tada Never Falls In Love on your Microsoft console. The link to the page is available here (United Kingdom – United States). HIDIVE is the home for a bunch of anime licensed by Sentai Filmworks and Maiden Japan. For the UK there are over 220 shows available plus a fair amount of movies and OVA specials with English dubs included whenever possible. Simulcasts and Dubcasts are also part of the service so you can watch the latest anime in both English and Japanese audio when they air. Uncensored/Home Video versions are also available. HIDIVE is a new way to stream hit titles like GATE, Food Wars!, Monster Musume Everyday Life with Monster Girls, and more! 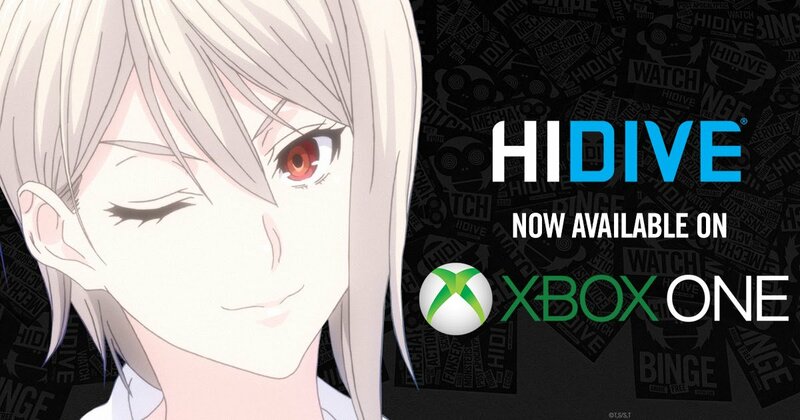 With this free Xbox One app, HIDIVE subscribers can now enjoy ad-free HD anime on the go. With new simulcasts every season, an ever-growing collection of dubs, and exclusives including fan favourites such as Legend of the Galactic Heroes, and Elfen Lied and new content added daily, there will always be something new to watch. You can view the official HIDIVE website for more information as well as their subscription options. After a long delay, apps are now beginning to appear for the new streaming service.